A few months ago, I featured a cup of coffee made with this Personal Drip Coffee Filter from Starbucks Japan. Starbucks USA doesn’t feature the product on their website, but you never know. Compared to the Via system, the little sachets of instant coffee, they are more expensive at over $2 a cup. But at 4am in a hotel, when you have to get up early, they make a good alternative to rushing around trying to find an open coffee shop or room service, even in Japan. But how do you make coffee with ears? There are two methods: the simple method according to the packet & the variation. 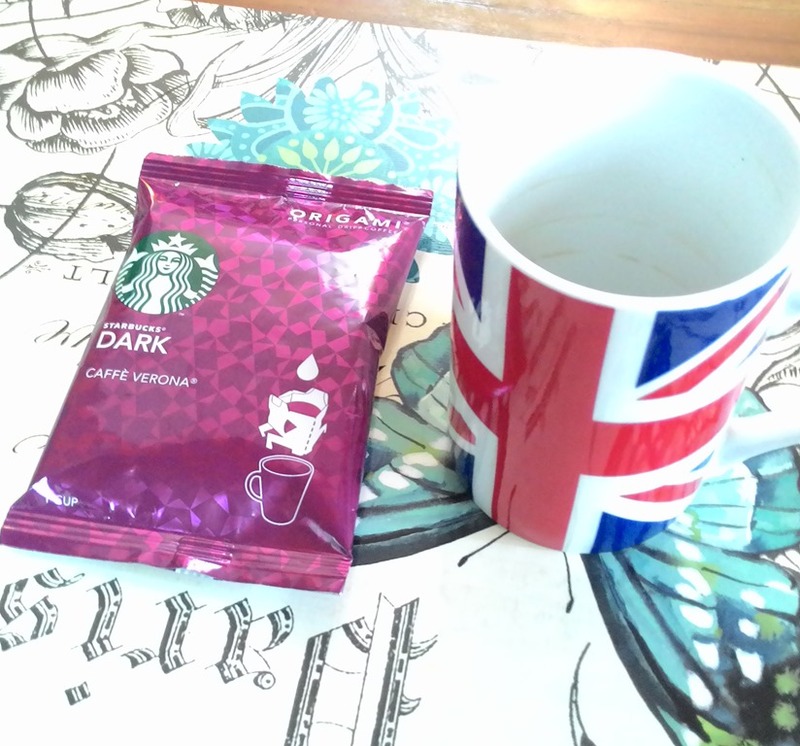 In Japan and Taiwan, you’ll find many different manufacturers make coffee pouches like this. Each design is slightly different, but the general principles will work as I show you here. You need one tea cup (not a mug), big enough to hold the coffee packet, once opened; 200+/-cc of hot (not boiling) water; and sugar or cream, if you don’t drink it black. Open the packet carefully (with scissors if you have them), try not to tear the paper holder inside. Then pull out the insert from the foil packet. 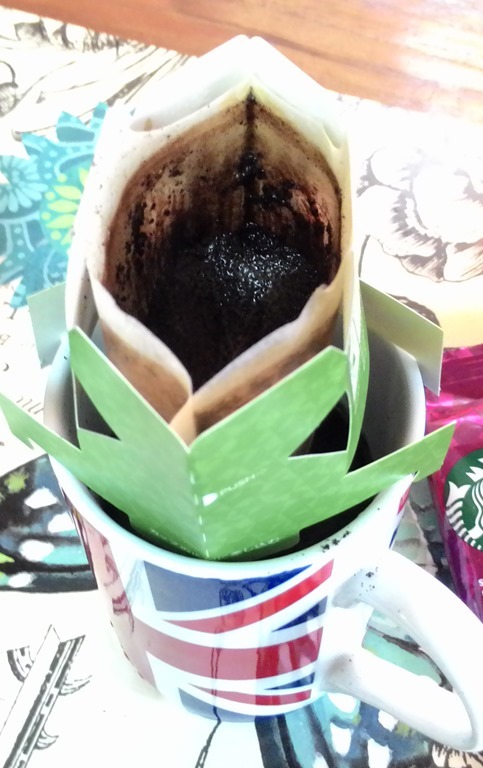 Open the paper insert (it looks like a little pouch of coffee), open the right way up or the coffee will spill out! And place over your cup like in the picture. Make sure each leg stands over the edge of the cup, this will provide support for the unit once you start pouring hot water. I’ve started pouring hot water now. Don’t use boiling water! Good coffee is made with water that has been boiled and is hot enough (ie. about 90~95C or approx. 190F). Pour gently, pour carefully. Stop if you see a problem. 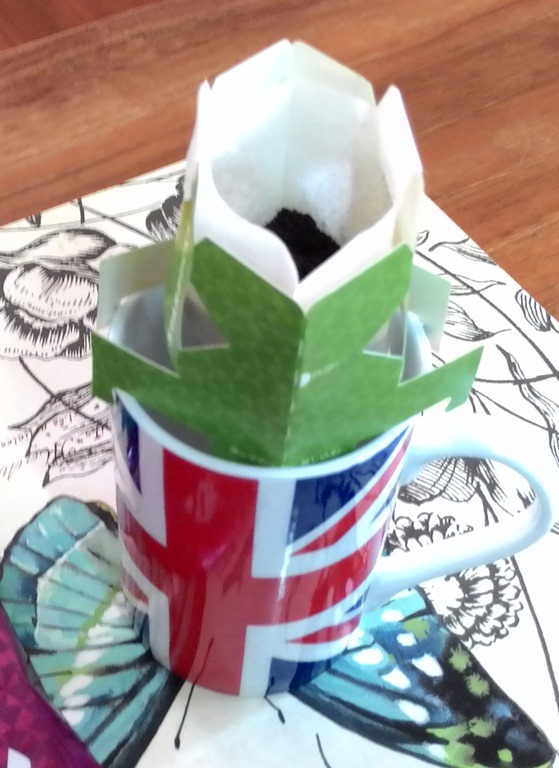 Pour the first until you see a small bloom, then let it filter into the cup; keep pouring gently and stopping until the tea cup is full or you have as much as you need. Don’t put too much water through, it will just become watery. There is a delicate art to making coffee this way, because you don’t want the entire unit to fall over or get knocked off. Take it EASY! Don’t rush! It makes a great cup of coffee, as fresh as the 10g of coffee inside. Better than instant any day! Next time I’ll show you how to make the perfectionist’s way… stay tuned!